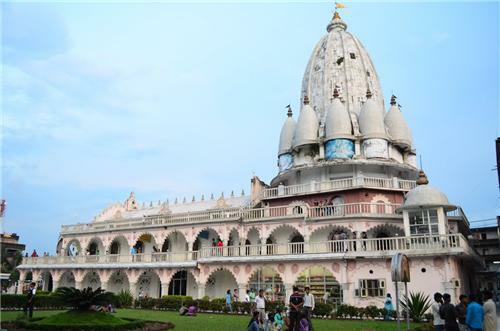 If you want to take a break from the artificial, monotonous and stressful life and want to get in touch with the divine, the best place to visit is ISKCON temple, which is located at ISKCON Road in Siliguri. From a few disciples, ISKCON has grown rapidly and now has more than 300 centers all over the world. Founded by Swami Prabhupada in the year 1966, this place is a must visit for all Krishna devotees and also others who want to spend some of their time interacting with the divine in the holy ambiance. It will take you to a different world altogether and you are likely to get lost in the spirituality and beauty of the ISKCON temple. The temple is quite huge and has modern structures, huge corridors, murals, etc. It also has got beautiful lawns all around. Though the deity is the same but it has been presented in an innovative manner here. Modern architecture and ethnic traditions have been blended beautifully to build the temple. Taking a note of the temple timings will help you to attend all the functions that take place here throughout the day. Without the taste of Gobinda Bhog, your visit to the ISKCON temple will remain incomplete. Here one will get delicious pure vegetarian food prepared with great care and served in a unique manner. The accommodation provided as of now is not much. The guest house presently has only 10 rooms and the visitors are charged RS 400 per day for the rooms. Advance booking is a must if anyone wants to stay at the guest house. However, it is worth mentioning that the guest house is situated among tranquil and serene ambiance. In case one does not get the guest house, there are various other options available for accommodation also. One can contact the below mentioned number for any query. It us very important that silence is maintained to avoid any disturbance to others present. A visit to the temple is guaranteed to provide visitors a great time and great memories to cherish forever. The Temple President,ISKCON Temple Siliguri,Hare Krishna,Requesting accommodation at the Temple guest house for two of us in early March 2019 for two to three days, starting 5.3.2019. Please communicate for us to crystallize our programme. In the event it will cost me a bit of money, please note agreeing to pay and if necessary can send that in advance please. Either of us are retired Senior Citizens !Pronams and Hare Krishna !From : P. K. Sarkar.Membership no. CAL 8888.Mo. 9768357814.